AutoUp 1.21 (52K - Windows) - What's new? Display the running services list. Display the status of a particular service. Wait a given amount of time for a particular service to start. Add and Remove applications to be run by Windows at machine startup. Add and Remove applications to be run by Windows when the current user logs in. 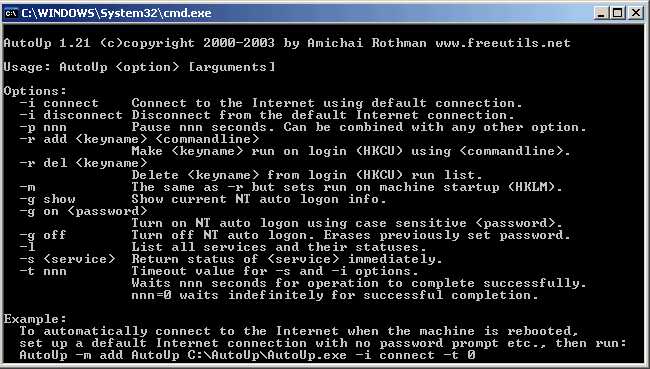 Set a NT/2000/XP user to log on automatically when Windows starts, bypassing the logon (Welcome) screen. Connect and Disconnect from the Internet using the default Internet connection (Dialup or VPN). Automatically connect to the Internet using the default Internet connection (Dialup or VPN) at Windows startup. AutoUp is useful mainly for administrators and advanced Windows users, for manually changing startup settings or for use in startup batch files. AutoUp is a standalone console (command-line) application, and requires no installation. Run AutoUp with no parameters from the command line for usage and options list. Fixed Internet connection options when used with -t 0 option - waits indefinitely as it should. Added Internet connection options - connect and disconnect default Internet connection. This is very useful for having a computer automatically connect to the Internet at startup (after a reboot). Please write in with any bugs, suggestions, fixes, contributions, or just to drop a good word and let me know you've found AutoUp useful and you'd like it to keep being maintained.